You are here: Home » » For the Homeowner » Home Maintenance-Consumer Info » Why Did My Air Conditioner Suddenly Stop Working? Your air conditioner was working fine, but then it stopped without notice. 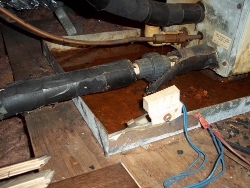 One reason may lie with the evaporator coil and its drain lines. I enjoy walking through a home with my clients, explaining what I am seeing. This may be due to my educator tendencies. I want people to be able to see the signs that there is a problem with the function of their home, so they can act upon what the home is telling them. During one inspection, I pointed a tube coming out of the soffit above a window. There was a constant water dripping down. I said here is a problem. My client looked at me and asked what problem. The dripping water, I replied. He said this happens on his current home, and he did not know that it was an issue. I explained that the cooling system for his air conditioner consisted of a device called an evaporator. This cooled the air by letting the air pass by tubes carrying the refrigerant from the compressor. This caused moisture in the air to condense on the tubes. This water would fall down to drain off in the primary drain line. The line over the window is the secondary drain line. When water is coming out of the secondary line, then something is not working properly. The tube is placed over a window, so you can see the dripping water to know that there is a problem. I told him that the air conditioning system was not running well, and that this was the sign. Some homes do not have this secondary line, and this is where a homeowner can become confused as to why his air conditioning stopped working. If you live in a town home or a condominium, you may see a device with a lever on your pan under your evaporator. This one was found in a home. The picture shows the evaporator with three lines. The top line looks bigger, and it is insulated. This is the return line with the cooled refrigerant. The next tube is a small copper tube. This line has the heated refrigerant going to your compressor. The next line down, which is partially insulated, is the primary drain line. This can go to a sink in the home, or it could drain to the exterior. On the exterior, the primary drain line will go to the ground, not over a window. Then we see a rusty pan with water in the pan. On the pan is a white box with a metal lever on it. This is a sensor, which is taking place of the secondary drain line. If the secondary drain line tells me that there is a problem with my air conditioning, is it not better than this sensor? The sensor is another method for indicating to you that something is wrong with the system, and the sensor accomplishes this in a more dramatic way by turning off your air conditioner. The device is a simple pressure sensor. Water rising in your safety pan causes the lever to rise. The rising lever pushes down on the switch. Once the switch is engage (the lever pushing on the switch to its fullest when the water is at its highest), the sensor sends a signal to the AC to turn off. If the sensor fails to turn off your unit, the safety pan will overflow causing moisture damage below. The secondary drain line allows your system to keep working while the problem persists, and the sensor will cause the unit to suddenly stop working without warning. This sudden stop catches homeowners off guard, so many prefer the secondary drain line, but that does not mean that it is better. A dripping line or a unit shutting off means you need to call your HVAC technician. You could empty the pan to restart the unit, but you will have the problem again. In the case of this photograph, you can see that the pan has rust stains all over. This would only happen if water has been in the pan quite a bit. One thing to note is if your air conditioning system uses this type of a sensor shutting off the unit, there should be a note indicating that this sensor is present. If your air conditioning suddenly stopped working, look at the safety pan. Is the pan filled with water? Then you may have a sensor turning the system off. This entry was posted on Tuesday, September 20th, 2011 at 2:30 pm	and is filed under Home Maintenance-Consumer Info. You can follow any responses to this entry through the RSS 2.0 feed.